The South Asia of today is an interactive force between member states on the one hand and their collective pursuit of common interests on the other. The problem is to harmonise the two and make them complementary. So the two levels of diplomacy in South Asia are to foster regionalism – as embodied in South Asian Association for Regional Cooperation (SAARC), in accordance with its objectives – and promote amity and har­mony between member states. The history of the region since its landmark transformation in 1980, following the establishment of SAARC, can be described as an endeavour to realise the idealism of its founding fathers. This is of course a formidable task for any region, considering that they’re all heirs to history. But the success of the European Union (EU) is a monumental testament to the ability of states to rise above history and re­fashion the future. This is a matter for the common will and resolve of member states. 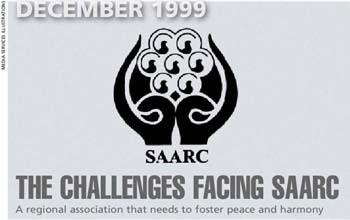 SAARC’s history can be summed up as a mix of succes­ses and setbacks. Nonetheless, what is important is that SAARC lives on, showing resilience and the ability to face up to challen­ges – and its latest initiatives seem to augur well for its future. The highlights of this record are the adoption of the SAARC Charter in 1983, assumption of summit status in 1985, establish­ment of a secretariat in 1987 and agreement on the SAARC Preferential Trading Arrange­ment (SAPTA). All the while, tension has been simmering between member states that erupted with the nuclear tests by India and Pakis­tan, followed by armed conflict between them in Kashmir. These events have raised fears of a nu­clear war and threats to security in South Asia apart from ques­tioning the credibility of SAARC. The future of South Asia depends on its ability to face this challenge of reconciling the contradictory trends of escalating military tensions and expanding the scope of SAARC. And it is against this backdrop that one should view the latest developments, which may come as a surprise. First of all, there’s the decision taken at a conference of SAARC Foreign Ministers in New York in 1999 to work towards the establishment of a South Asian Economic Union. This concept had originally been proposed by the Eminent Persons Group as part of its vision for SAARC for the first quarter of the 21st century. This process was to proceed alongside the parallel objectives of SAPTA and the South Asian Free Trade Area (SAFTA). It was to be modelled more or less along the lines of the EU while its main objective was to be an economic grouping. At a press conference on this subject in New York, Sri Lanka’s Foreign Minister commented that it is quite remarkable that there’s a clear movement towards the establishment of a South Asian Economic Union that includes all countries in spite of the fact that Pakistan and India have serious political problems between them. He added that SAARC was demonstrating its continued capacity to adjust its course as may be necessary and institutional strength. Equally dramatic were two further steps that were taken by SAARC to expand its activities. These were for cooperation with the EU and Association of Southeast Asian Nations (ASEAN). Cooperation with the EU would be in the form of joint projects that would provide for a workshop on the European Regional Integration Process, study of EU experiences in areas relevant to SAFTA, and study programmes on standards and the EU-GSP scheme. The meeting with represen­tatives of ASEAN was a continuation of earlier consulta­tions that had been initiated at meetings of the World Trade Organization (WTO) in Geneva. The object was to promote cooperation between the two – especially in international trade, on which there had been ongoing consultations between the two Secretaries-General. Indeed, past political highlights of South Asia are well-known with the nuclear explosions of 1998 and their traumatic effect on the region, followed by the armed encounter between India and Pakistan, and the concurrent political drama with India return­­­ing the Bharatiya Janata Party (BJP) to power and Pakis­tan experiencing a military coup. What do these add up to for the future of South Asia? And do they mean that it is on the brink of a military catastrophe or threshold of an era of peace and prosperity? It is up to the parties concerned to act with restraint and states­man­ship, refraining from brinkmanship or provocation that would cause an escalation of violence.